but loved Christ who loved you. You have gone to Him rejoicing! Pray ceaselessly to Him for those who honour your memory. beholding in the Spirit the Son glorified in you with the Father. Pray to Him to save and enlighten our souls! an apostle of Christ, announcing the baptism of salvation. you sanctified them throughout all the lands of your kingdom, blessed one. watered by the Holy Spirit. abundant sources of miracles for all the faithful. pray to Him to save and enlighten our souls. the father and guide of the people of Rus’. he has gone to Christ, rejoicing with his grandmother Olga. he destroyed the idols, and trampled them underfoot. He nurtured for us Boris and Hlib, his precious posterity. and keep the feast with love. to grant peace to the whole world, and to save our souls! Out of his love for mankind the King of heaven appeared on earth and dwelt with men, for He assumed a human body from the pure Virgin and was seen in the flesh He received from her. He is the One and only God having two natures but not two persons. Wherefore we profess and declare the truth that Christ our God is perfect God and perfect Man. O Mother, who knew not carnal union, intercede with Him that He may have mercy on our souls. and he has received a kingdom and a crown in the heavens. rejoicing with the first mother, Helen. was born of you, O most pure Virgin. By accepting my nature, He freed Adam from his ancient curse. Unceasingly we magnify you as the Mother of God! Rejoice, O Lady: the Protection, Intercession and Salvation of our souls! glorified and radiantly crowned by him. I have exalted one chosen out of the people! rejoice now in the holy Church, for this is the day of Vladimir. for by holy baptism he has enlightened his people! I have anointed him with my holy oil! Rejoice divine Vladimir, our ruler, and guide for the faithful! the calm haven for those who flee to you. the intercessor for those who sing your praises and faithfully magnify you! 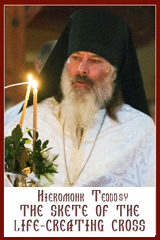 teacher of godliness, preacher of the faith, and first among the princes of Rus’. rejoice, most brave soldier of Christ! and having delivered us from his wiles, you led us to Christ, our King and God! Rejoice, Mother of God, Virgin Mary full of grace! * The Lord is with you. * Blessed are you among women,* and blessed is the fruit of your womb. 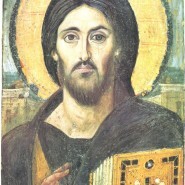 * For you have borne Christ, the Saviour* and Deliverer of our souls. Troparion, Tone 4: You resembled the merchant who sought the pearl of great price,* O Vladimir, glorious in might:* seated on the throne of Kiev, the divinely-saved mother of the cities of Rus’,* as a seeker you sent envoys to the Imperial City* to know the orthodox faith,* and found Christ the pearl, who chose you as another Paul,* and removed your blindness both spiritual and bodily in the holy font. * Therefore we, your people, feast your falling asleep. * Pray that the leaders of Rus’ be saved with those entrusted to them. Kontakion, Tone 8: You emulated Paul the great apostle,* O glorious Vladimir;* late in life you abandoned your zeal for idols as childish thinking,* and as a full-grown man you were adorned with divine baptism’s royal purple. * Standing with joy in the presence of Christ the Saviour,* pray that the leaders of Rus’ may be saved with those entrusted to them. verse: I have exalted one chosen from among My people.